Responding to questions at his annual televised question-and-answer session, Putin said: "We have done much to break the backbone of terrorism, but the threat is not eliminated." Last Friday's bombing, which claimed 26 lives and left a further 90 people injured, was Russia's most serious terror attack outside of the North Caucasus since 2004. And the premier added that the country had suffered greatly in the global fight against terrorism. "Our country has been, I think, one of the main victims of terrorism, especially in the mid-90's and early 2000s," - said Putin, who from 2000 to 2008 served as president of Russia. Police have since issued identikit images of four suspects connected with Friday's rail bombing. The three men and one woman were spotted in a hide-out near the track before the explosion derailed the high-speed Moscow - St. Petersburg train, said North West Russia's acting police chief Vadim Kashirin. More than 400 witnesses have been questioned and results of the preliminary investigations will be published in ten or twelve days, RIA Novosti reported. Earlier a group of Chechen separatists connected to warlord Doka Umarov claimed responsibility for the attack, contradicting a similar claim by ultra-nationalist group Combat 18. But Chechen president Ramzan Kadyrov has dismissed Umarov's role in the killings. 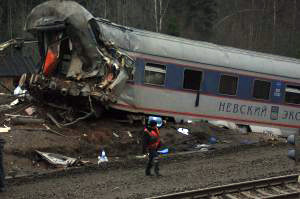 "There is nothing new in the statements that the train was allegedly bombed on orders from Umarov. Several months ago they also claimed responsibility for the accident at the Sayano-Shushenskaya [Hydroelectric Power Plant]," Kadyrov said. "However, we must not exclude that by taking responsibility for this terrorist act, Umarov wants to raise his standing in the eyes of his foreign backers as he has recently been cornered by the joint efforts of the FSB and other federal departments and his gang is suffering losses." Kadyrov added that Umarov - who is a suspect in a similar attack in 2007 - was his "enemy number one" and warned that he might be deliberating trying to mislead investigators.